In addition to McKinney, we also service Allen, Fairview, Frisco, Princeton, Anna, Melissa, Plano and surrounding communities. When you’re trying to make a lasting impression with printed materials, you want to consult with a local print expert. That’s where we come in. Stop by The UPS Store at 4100 Eldorado Pkwy to talk with a real person, someone that can help you design and print that perfect flyer, brochure, menu, invitation, banner or sign. We offer a variety of printed materials and are your local resource here in McKinney for all of your printing and copying needs. With shredding services available at The UPS Store located on 4100 Eldorado Pkwy in McKinney, you can get rid of your personal and business documents using one of the leading document destruction vendors, Iron Mountain®. Shred your items to help protect yourself and your business from identity theft. You can count on the printing professionals at The UPS Store McKinney to help you make a lasting impression. We offer a wide range of printing and copying services to help you promote your small business or prepare for your personal event or presentation. Place your order online or stop by our store to get started. The UPS Store is your professional packing and shipping resource in McKinney. We offer a range of domestic, international and freight shipping services as well as custom shipping boxes, moving boxes and packing supplies. The UPS Store Certified Packing Experts at 4100 Eldorado Pkwy are here to help you ship with confidence. When you open a mailbox at The UPS Store, you get a lot more than just a box with a key. You'll get package acceptance from all shipping carriers, mail receipt notifications, and a real street address in 75070, not just a PO Box #. Apply today. Looking for a notary public in 75070? The UPS Store at 4100 Eldorado Pkwy offers convenient notary services near you. Stop by today to get your documents notarized and check another item off your to-do list. The UPS Store offers convenient and affordable document shredding services in McKinney, TX, provided by Iron Mountain®. Shred your items to help protect yourself and your business from identity theft. Get easier checkout and flexible billing for your small business. Learn about opening a house account at The UPS Store on 4100 Eldorado Pkwy. The UPS Store in McKinney is a locally owned and operated small business and we care about our customers. Our staff has the knowledge and expertise to handle all of your mailbox, packaging, shipping, printing and other small business services and we are passionate about what we do. Our Other McKinney location is located at 6841 Virginia Parkway, Ste 103, McKinney TX. We proudly serve the greater McKinney area including Allen, Plano, Frisco, Prosper, Anna and Greenville communities. We offer a wide range of print services, including copies, business cards, posters, banners, brochures, marketing and sales materials and much more, We offer complete finishing services including binding, laminating, tabs, and more, as well as specialty papers. 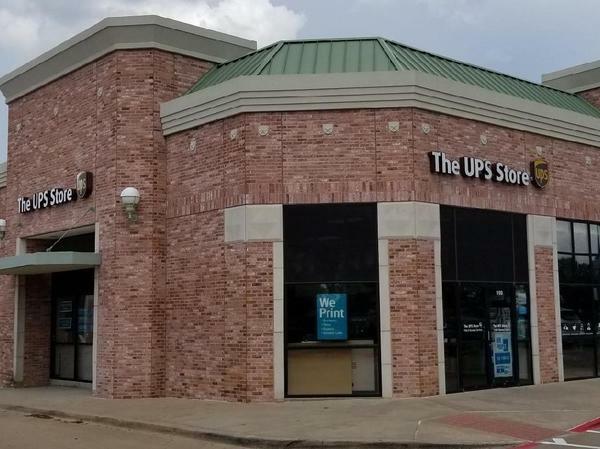 At your McKinney The UPS Store, you can get a mailbox with a real street address and secure 24-hour access to mail and postal deliveries. Additional services include mail forwarding and holding, package notification, and the ability to call in to check for new mail. You'll also find most of the postal products and services you need right here at your neighborhood McKinney The UPS Store. We can help advise you on the best service options from one location without standing in postal lines. We pack items using the highest standards to help ensure their safe arrival. Regardless of its value, size, shape and weight, our staff has been professionally trained to provide full-service packaging and custom crating so packages withstand their journey. We are the packaging experts. As the packaging-and-shipping experts, we offer a wide variety of Shipping options from UPS, USPS, and DHL; from ground and overnight service to weekend deliveries and freight, across the country or around the globe at low prices direct from UPS. There is nothing too big or small for us to ship! Our professional notary public services make life easier. Stop by today for professional notary services that fit your schedule. Take an important step in protecting your identity. Shred old documents and files securly using our convient and easy Document Shredding Service! We also offer faxing services (sending and receiving), Moving Supplies, Office and Mailing Supplies, rubber stamps, greeting cards, key duplicating and Recycling services. The UPS Store in McKinney, TX is here to help individuals and small businesses by offering a wide range of products and services. We are locally owned and operated and conveniently located at 4100 Eldorado Pkwy. While we're your local packing and shipping experts, we do much more. The UPS Store is your local print shop in 75070, providing professional printing services to market your small business or to help you complete your personal project or presentation. We offer secure mailbox and package acceptance services, document shredding, office and mailing supplies, faxing, scanning and more. Everything for your small business, even shipping. Chances are in this busy world you have a lot going on…we are here to help, from getting your items packaged and shipped to printing your documents. Your McKinney, The UPS Store, offers you the quality services you've come to expect from your neighborhood location providing you with convenient, value-added business services. Whether it's great shipping options, or our full-service packaging, mailbox services, faxing, or printing services, freight and international shipping, postal services, and notary services you can get it done at your McKinney neighborhood The UPS Store. We take pride in our business, therefore every customer that walks through our doors are treated with respect and entitled to our expert advice. Come visit our Full Service McKinney location in this Self Service world. Business cards, banners, posters, flyers, brochures, postcards, menus, sales and marketing materials, presentations, and just about everything else, were your one stop print shop. Bring in your design or let us do it for you! The McKinney, The UPS Store has the best address in town, and with package receiving, package and mail notification, and mail forwarding and receiving with 24 hour access. Your New Address is right around the corner! The UPS Store in McKinney has a Notary on-site during our normal hours, Monday through Saturday. Appointments are available, but not required. Now matter how BIG or small We ship it all! Let us handle all of the details for worry free shipping and expert packaging. Safe, Secure, document shredding. At only $0.99 cents per pound, what is your security worth? We are the packaging experts to ensure the safe delivery of your shipped items. We offer a money back guarantee with our Pack and Ship Guarantee. Compare our reliable shipping options side-by-side with UPS, USPS, and DHL offerings. We also carry Stamps and offer Postal Services. You can count on us to pack and ship your items domestically or even over seas! Do you need bound presentations, a real street address mailbox, office supplies shredding, or a notary? We can do that. When it comes to the logistics of running your business, whether it is big or small, near or far, The UPS Store McKinney has got you covered. We've got you covered. The UPS Store McKinney Eldorado in McKinney, TX offers the following products and services. Website Privacy Notice for The UPS Store Center Blue Emerald, Inc. This privacy notice ("Notice") describes the practices related to information collected by the individual The UPS Store entity Blue Emerald, Inc. (referred to in this Notice as "Franchisee", "our", and "we") from visitors to this website ("Website"). This Notice only applies to information collected on our Website(s). This Notice does not describe the information collection practices of The UPS Store, Inc., United Parcel Service, Inc. ("UPS"), or any of its subsidiaries or affiliates, or any other The UPS Store franchisee. To the extent required by applicable law, California residents may ask us to provide them with (i) a list of certain categories of personal information that we have disclosed to third parties for their direct marketing purposes during the immediately preceding calendar year, and (ii) the identity of those third parties. To make this request, California residents may contact us as at store4094@theupsstore.com. Welcome to the website of The UPS Store Blue Emerald, Inc., a The UPS Store center location independently owned and operated by Blue Emerald, Inc.. This Website is provided by, or on behalf of Blue Emerald, Inc.. This Website may be accessed from various locations both within and outside the United States of America (“USA”). Access to and use of the Website, including functionality and features and products and services available through the Website, may be inappropriate, prohibited or restricted in certain jurisdictions outside of the USA. In addition, certain functionality and features and products and services available through the Website may not be available in jurisdictions outside the USA. We make no representations or warranties that the Website is appropriate or available for use outside of the USA. If you access or use the Website from outside the USA, you do so at your own risk and are responsible for complying with the laws and regulations of the territory from which you access and use the Website. This is a general audience website and users of all ages are welcome to browse the Website. However, if you are under the age of legal majority to form a legally binding agreement under applicable law, you should not use any of the products or services offered on the Website, download any Materials or Software, or provide any information about yourself through the Website. The Website Privacy Notice for The UPS Store center Blue Emerald, Inc. posted on this Website governs the use and disclosure of personal information collected from or provided by you at the Website.